A year ago, we sat down with the Legends of Aria team to discuss their fledgling MMO that had then just changed its name from Shards Online and reimagined some of their core gameplay. This year at PAX East, it seems the team has done it again. One of the big questions that hadn’t been answered by the team at the time was whether the game was going to be a themepark or sandbox MMO. In the intervening year, that question has been resolved firmly in favor of a sandbox. The folks at Citadel Studios have gone in and removed all quests from the game and have made it quite clear that Legends of Aria isn’t intended to be a traditional MMO. Even starting in chargen, the experience is very different. Instead of picking a class, players first have to pick what their three primary skills are, Manifestation, Evocation, and Channeling, and then pick a fourth one that could be directly assisting their fighting abilities or something that is normally flagged as a crafting or even hobby skill. Yes, you can actually pick Lumberjack as your fourth skill slot and be okay. At that point, once you’ve decided the core of your build, you can pick from things like ‘knight’ or ‘rogue’ which is more like simply picking a fighting playstyle. As this is a sandbox, it’s now entirely possible to play without fighting and to focus on skills that other games tend to classify as crafting or even hobbies. The Citadel Studios founder and CEO Derek Brinkmann made a point of noting that their game isn’t intended for everyone. Unlike many other MMOs, their starting area isn’t a tutorial and/or safe zone where it’s hard to die. While a player can work around the map and avoid mobs to go gathering for crafting, for example, it’s a tougher experience. An immersive world, players who get past their Initiate status will start losing items upon death and have to complete a corpse run in both directions. First they have to find a rez shrine, then run back to get their stuff… if it’s still there later. Another feature that points to the game’s attempt to encourage players to find their own way in the world is the game’s map. Unlike other games, Legends of Aria‘s in-game maps have no Points of Interest flagged on them. You can’t even see a GPS pointer of where your character is. Citadel’s devs want players to actually go out and explore their world, now populated with three additional new starting cities, and learn to remember where things are. There is no fog of war to hide parts of the map. However, for players who desperately need a different map experience, the official game wiki does feature a player-made interactive map. Brinkmann said that Legends of Aria is intended to be a group game, while solo play isn’t discouraged. There are some interesting innovations in the game. 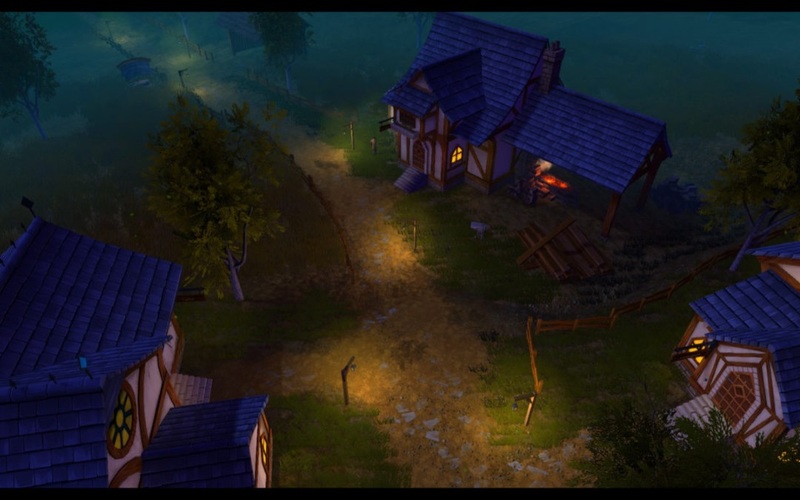 Players can set up their housing plot to create things such as merchant stalls to either sell or even give away crafted gear and items. The dev team pointed out when we ran across a bug during the demo that colorblind mode for accessibility is in their backlog of features to add later on. While I was playing, I noticed that as in-game time passed and it became night, it was a full-on dark that would appeal to players hoping for an immersive experience. I sincerely felt the need for some kind of light source to help me find my way. The game features a minimalist UI, with small windows for graphics and a fairly intuitive UI experience in general. For myself, someone who likes to use cosmetic appearances in games, I was happy to see the innovation as to how Citadel plans on allowing players to do just that. Most games will create multiple textures for each outfit’s various colors and swap between those individually-colored textures. Legends of Aria takes a different approach and simply uses a color replacement on each singular texture, and I could tell that it provided a richer color that worked well with the lighting system in-game. Overall, the isometric MMO is in a solid place right now. The game is in closed beta at this time, with founder’s packs available for purchase on legendsofaria.com. There’s also a wealth of information on the development on that site, including the overarching lore and details on just how customizable the gamespace will be that we had reported upon last year. It’s definitely worth checking out.